YOUR HEN WILL STOP LAYING MORE EGGS! Place a full clutch of dummy eggs in front of your bird and she will think she has finished her breeding cycle. She sits on her fake eggs and doesn't need to lay any more. She is a happy healthy hen who will eventually loose interest in her fake nest eggs. Dummy eggs are also used to increase chick survival by incubating real eggs while replacing them with our non-toxic solid plastic fake eggs. 1. Choose your bird’s page link in the “DummyEggs & Nest Bowls” drop down menu above. 2. 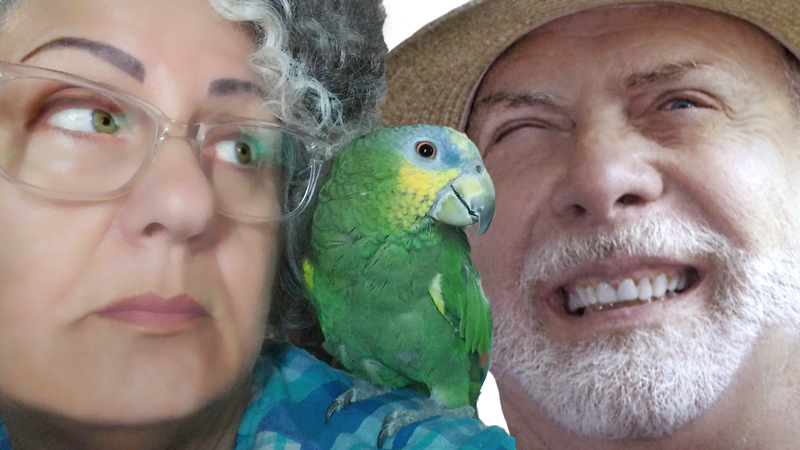 Scroll down once on your birds page to see products. 3. Select your choice in DROP-DOWN MENU above big button. 4. Click on ADD TO CART button which will take you to PayPal shopping cart. 5. You can then continue shopping, or check out. 6. Check out by following the prompts. 7. If you experience trouble checking out, please restart your browser or phone and try again. 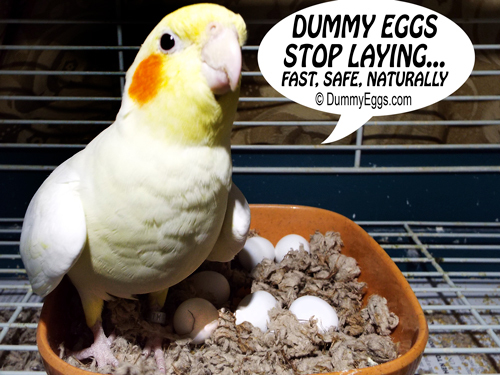 The Secret to Dummy Eggs: Birds Count Their Eggs! Control Egg Laying… Fast, Safely, Naturally. BIRDS COUNT THEIR EGGS! Hens start building their clutch (nest of eggs) by laying until she has the proper number of eggs for her species. Her DNA tells her exactly how many eggs she should lay, extra eggs will be pushed out of the nest. Dummy eggs inhibit your bird from laying more eggs to replace ones that have been removed or broken. And because they are plastic, they won’t hatch! Remove the real eggs and relax. Your bird can now sit her fake eggs until she loses interest in 2 to 4 weeks depending on species. You can find the number of incubation days for your species on our Size Chart. We want her to think she has completed laying all the real eggs she is supposed to. This is what signals her hormones to turn off and she naturally stops laying more eggs. It is all a numbers game, it is better to have too many eggs than too few. Many birds, male and female, break their eggs and then keep replacing them. This leads to calcium depletion and health concerns. There are no health concerns with a healthy hen who is laying her normal natural eggs for reproduction. Dummy Eggs cannot stop your bird from ever laying another egg, but work very effectively to control the number of eggs she will lay in each cycle and in her lifetime. 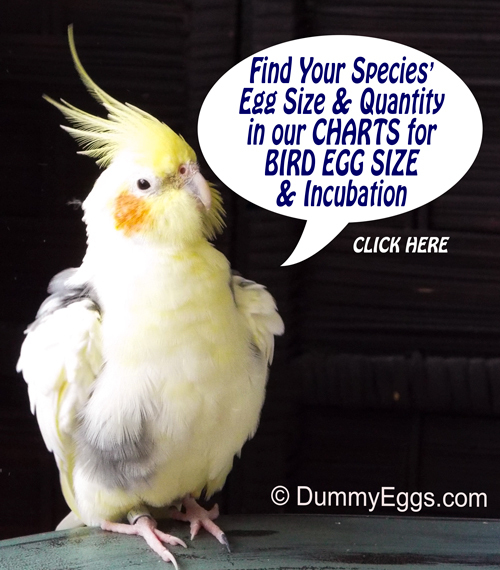 Please use our Size Chart to determine the egg size you will need that corresponds with each of the most popular domestic birds. Also included in this reference chart are the number of fake dummy eggs you will need to purchase based on average clutch size. Make sure to remove the dummy eggs after the incubation time for your species. *Clutch size refers to the number of total eggs laid in a single nesting cycle. We also sell Complete Nest Bowl Kits for each bird species. and wide selection of calcium blocks.